Funny wedding card messages: Planning to write a funny quote on a card instead of the cliché romantic wishes? Give the newlyweds something to laugh and smile about by using sarcasm and humor. From sayings about how boring a marriage can get to quirky quotes about married life – this post will help you unleash the comic monster within. Come up with your own original jokes and funny one-liners which you can use in a speech if you are going to be the best man or the bridesmaid. Rub it in by posting them on Facebook and Twitter and don’t forget to tag the newlyweds in your tweets and post. Last but not the least, follow up your crass greeting with the most beautiful wedding gift so that you can sweetly make up for your funny stunt. 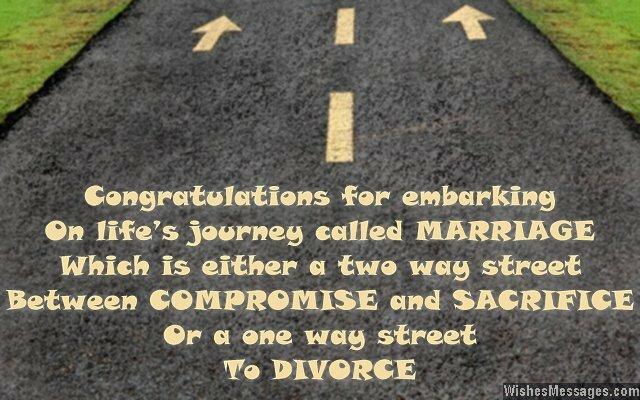 1) Congratulations for embarking on life’s journey called MARRIAGE which is either a two way street between COMPROMISE and SACRIFICE or a one way street to DIVORCE. 2) Saying I do while getting married is like blindly clicking on the I Accept checkbox while installing new software in your computer. You do it despite having no clue of what will come next. 3) Your wife complements you perfectly. She shadows all your flaws and accentuates your qualities. Now we know why you decided to get married. Congratulations. 4) Marriage is the juncture where SPENDING TIME WITH FRIENDS morphs from being a reality into being a wishful dream. 5) Before marriage – fun in bed. After marriage – fight in bed. 6) Congratulations for signing up for marriage – the most amazing way how love fuelled cuddles morph into anger fuelled arguments. 7) In the circus of life, you may have lived like a lion so far. But your wife, the new circus master will tame you into a domesticated cat in no time. Good luck for your tight rope act. 8) No amount of wishes or luck will protect you from the painful life of slavery you are about to start as a husband. Congratulations anyway. 9) A couple’s life cycle consists of various stages including dating, loving, marrying, fighting, threatening and possibly even divorcing. Congratulations for reaching step number three. 10) Do you know what late nights, parties and hanging out with friends on the weekend have in common? You won’t be able to do any of those from now on. Congratulations for your wedding. 11) I don’t mean to be the party pooper but I must warn you to gear up to live a life in which you will have to do all the things that you never dreamt of doing – sharing the TV remote, cleaning the house, putting your towel for a wash and asking for permission before going out. Congratulations. 12) Congratulations for finally succumbing to life’s biggest myth – a successful marriage. 13) Your match wasn’t made in heaven. It was made in my bedroom that you two used so often. Congratulations to my best friends for getting married. 14) Now that you are married, you must master the art of saying yes when you actually want to say no. Congratulations. 15) Getting married is like being in drama school. You get to practice everything from comedy to melodrama to tragedy. Congratulations. 16) As you become husband and wife, prepare to welcome a lot of strife. Each others faults you will point out, you will fight and argue without a doubt. 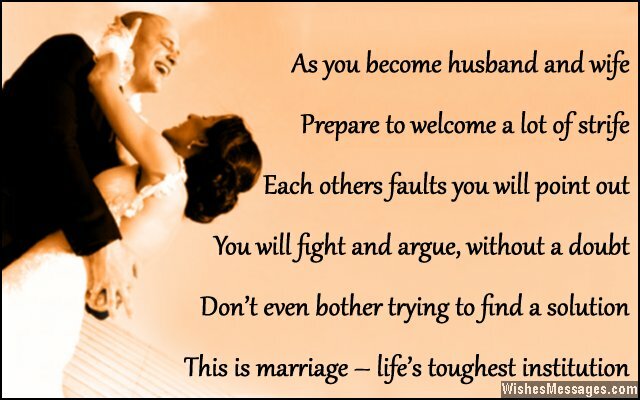 Don’t even bother trying to find a solution, this is marriage – life’s toughest institution. Congratulations. 17) As you walk down the aisle, don’t be nervous before saying ‘I do’ because you don’t have a choice anyways. Good luck and congratulations. 18) Wedding – one of the biggest expense of your life which marks the beginning of many more expenses including shopping, gifts, day care, schooling for children and possibly even alimony. Good luck to you. 19) After your wedding, your relationship status on Facebook will change from single to married while your real life’s status will change from being available to being always busy. Congratulations. 20) On your wedding day today, you have now become two from one. Does that mean I will get two birthday gifts from you both every year? 21) Congratulations – you just paid for a whole bunch of your friends and family to have the biggest party of their lives. 22) Knowing the entrepreneurial couple that you are, I was wondering if you could give me some insider tips so I can place my bets on how long you both will last? Congratulations for getting hitched. 23) Your wedding wows are actually an unsaid contract in which you agree to be tied down to your spouse all your life. Congratulations. 24) Walking down the aisle on your wedding marks your first step in walking towards a hurricane called Marriage. Good luck. 25) Some people say that a wedding is symbolic of a guy’s transition into becoming a man. I say it is symbolic of the end of a fun bachelor life and the beginning of a boring married life. Either way, wish you all the best. 26) I cancelled all my appointments and an important meeting just so that I could make it to your wedding. After all, free food and booze was just too lucrative to give up. Congratulations. 27) There is nothing worse than a friend getting married. Now my parents have one more reason to coax me hitched too. Congratulations. 28) I know I am going to have an awesome time attending your wedding because I will be reminded of all the money I will be saving by not getting married. Congratulations. 29) You haven’t just tied the knot with your wife today, you have invariably tied chains on your legs too. Congratulations. 30) Do you know that you are signing a marriage contract which does not give you the option of renewing it every year? Congratulations for signing your life away. 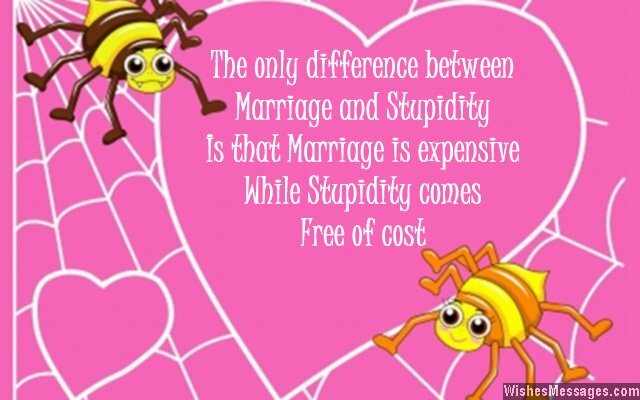 31) The only difference between marriage and stupidity is that marriage is expensive while stupidity comes free of cost. 32) Getting married is like becoming a child all over again. Be prepared to learn where to put your towel, how to keep the bathroom clean and organizing your clothes in the closet. Congratulations. 33) I am happy that you are getting married, but does that mean I have to buy two birthday gifts every year instead of one? 34) Congratulations – you have just committed to being annoyed, irritated and screamed at by one person for an entire lifetime. 35) Married life is the perfect proof of the fact that love is truly blind. The fights and arguments after your wedding will make you wonder why you thought it was a good idea in the first place. 36) Cupid may have shot the arrow of love, but who is shoot the arrow to prevent fights after marriage? Good luck to you. 37) You are about to witness the life’s biggest miracle – it is amazing how you will manage to live with a person with whom you fight, argue and quarrel on a daily basis. Congratulations for finding your miracle. 38) Marriages are all about sacrifice, hardships and letting go. Are you really sure you want to get married? 39) The innocence of newlyweds is really something. Everyone tries to find out the secret to a happy marriage, only to later find that the only secret is that there is no such thing as a happy marriage. 40) Couples get a big surprise after getting married because they fail to figure out life’s biggest mystery – when two become one, halved is the fun.